A Georgian Farmhouse set on a working dairy & arable farm on the banks of the River Wye. Three ensuite spacious bedrooms 1 with superking four poster, 1 with king double & 1 twin which can be a superking double, all rooms have refrigerators containing fresh milk, homemade biscuits, and beverage selection. Colour television with DVD & freeview. Guest lounge with information & maps of the area. So much to see & do is the comment often heard from guests. 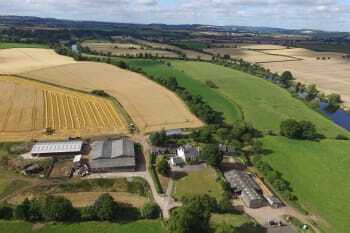 Central location for exploring Herefordshire Gloucestershire & Monmouthshire, with many castles, stately homes & gardens, Cathedrals & market towns. Total rates, from Sat 27 Apr 2019, to Sun 28 Apr 2019, for 1 nights. 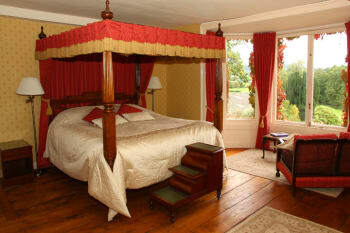 Lovely place to stay with a warm welcome, extremely comfortable bed and great breakfast. We can’t wait to return. We were made very welcome once again and breakfast was lovely. Very warm welcome. A superb breakfast. Bedroom facilities first class. Will always use this place whenever we are in the area. We stayed on our way home from Devon to Lancashire It was the perfect position so that we could avoid a large part of the M5 and the M6 We are all farmers so enjoyed the peace and quiet of the house and garden. 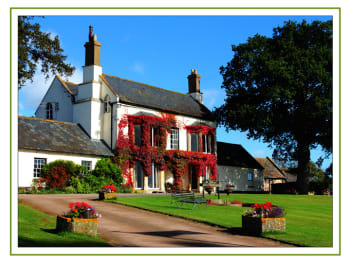 A very pleasant stay, excellent advice for our evening meal and great breakfast. A slightly temperamental shower was the only defect but I'm sure this will be rectified, thank you, Carol! Hospitable and friendly hosts. Easy access to accommodation. Pleasant surroundings. Good pub, White Lion within walking distance and good Italian restaurant, Avellino's in town. Excellent B & B . Very comfortable with very good breakfast. Hostess was friendly and helpful. We’ll come again ! Local pub, The Harewood End Inn, is very good. We had a friendly welcome from Carol on arrival, and a lovely holiday all round. The beds were comfy, the breakfasts were delicious and cooked to order, and Carol was always ready with suggestions and information. 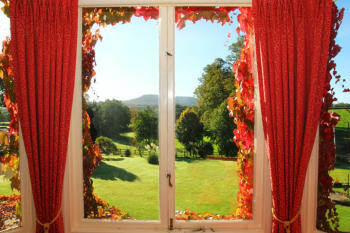 Such wonderful views too, from the comfort of armchairs by the big windows. Good to stay on a working farm as well. 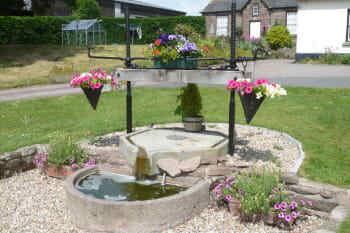 A great place to relax, visit places of interest or shop. Just ask Carol what interests you and she will point you in the right direction. Breakfast is wonderful. friendly, eager to help when needed. We have stayed at Benhall Farm seven times - we like it a lot! Lovely warm welcome we felt relaxed from the minute we arrived. Never stayed on a working farm before and it was perfect. We will certainly return. Thank you. Symonds Yat east - do the boat trip up and down the river excellent value at £6.50 each. Ross is a lovely little town at The Old Man of Ross’ very good! We went into town for dinner that evening. Loads of parking, not a vast array of choice for dinner (mostly takeaways) but we settled on the italian place. Had a lovely time, food was amazing. We didnt have much time to explore but there is loads to see around there. Carol was the perfect hostess and made us very welcome. Best Restaurant was the Avellino in Ross but we also eat at the following places in Wilton. 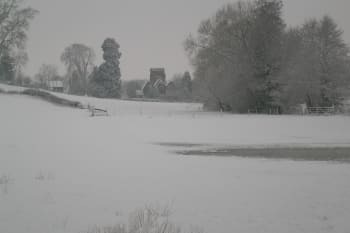 White Lion, Castle Lodge & Wilton Court. PLaces to visit. National Trust at Berrington Hall, Croft Castle & Croome Park. Also visited Hereford Cathedral, Pershore, Ledbury & Symonds Yat. Great place to stay, brilliant breakfasts lovely rooms. Carol was a perfect host and her family were so friendly. White Lion has great food with friendly staff and reasonable prices. Carol is a wonderful host .Breakfasts are all you could ask.Nothing is too much trouble .Beds are comfortable.Everything works.Very friendly. Small point- some of garden seats dotted around would clean up a little and would be used more. Lovely stay. We wish we had more time to enjoy the garden and lounge. If we are in the area again we will definitely stay. The most wonderful welcome with tea and cake- nice room. Excellent hosts. Wonderful breakfast with a large range of freshly cooked options. Simon and Carol were very welcoming and helpful. 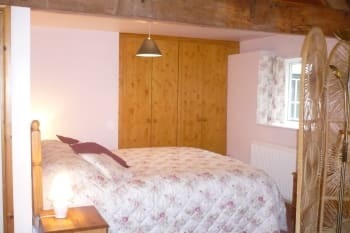 Easy to find and is in a reasonable walking distance to Ross on Wye. Will definitely go back for another visit. Place to eat -Moody Cow pub- Upton Bishop. Not in walking distance but about a 3 min drive away- brilliant seasonal menu. Delicious. Need to book. Average price. Best for clients with a car, but not essential as town is only a short walk away, but wonderful location for touring as by a roundabout for arterial routes. Breakfast fantastic, get fuelled up for the day! One very MINOR criticism - please can bars of soap be bigger than a grape and therefore fiddly to handle (I'm not into these fancy gels). 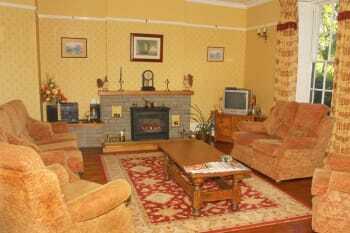 Nice environment for staying, very rural whilst without the impracticalities that usually go with that re location. If you walk into town (not far) do find your way back via the landmark at the top of town. Don't short cut that like we did on first night, and end up lost on the other side of the river, even in this small town. Note that eating outlets are closing their kitchens from about 9pm, so don't get caught out; there are a reasonable number of outlets, but they're not open late. You could do wirh replacing the stand in the shower wirh something that won't come crashing down. A warm welcome , plenty of laughs and helpful advice on things to do in the area. No 3 was a great restaurant, we also enjoyed Avalinos and the Kings Head for three quite different evening meals. We look forward to a return visit. Great breakfast, very friendly owner. Cherry Room OK but poor flow from electric shower and toilet cistern took ages to refill. No 3 restaurant in Ross is a must. Symonds Yat + rock good for walks Worcester good for city walk. cathedral good. Spetchley Gardens worth a look whilst near Worcester. We have stayed at the Farm a number of times now and find it perfect for us. Its very peaceful and we always have a great nights sleep. Carol is a great host and makes you feel very welcome. It is possible to walk into Ross but there are also eating places close by, Carol can advise local information if required. .
You will receive a very warm and friendly welcome at Benhall farm. 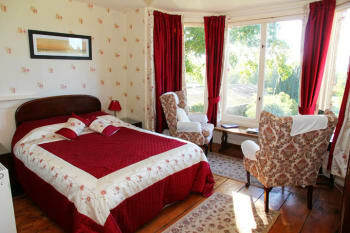 The room we stayed in was a traditional farmhouse bedroom, wonderful views and a very comfortable bed. The food was plentiful and delicious. I have to follow a gluten free diet and my needs were very well thought through down to homemade cakes and biscuits. Very friendly people. 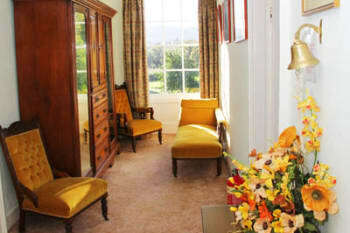 Lovely room with excellent facilities. We liked the fridge with fresh milk and water provided each day as well as homemade biscuits. Superb breakfasts with everything you could think of available! Quiet location even though it was a farm. Appreciated the mints daily on our tray! 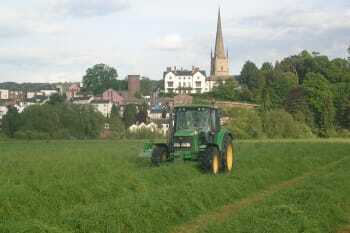 Good central location for visiting Hereford, Gloucester, Cheltenham and more local towns - Ross on Wye and Monmouth. 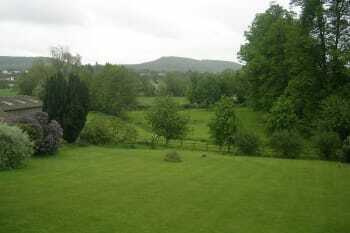 Lovely rural views and plenty of walking routes available - we walked on the Malvern Hills. April - wonderful daffodils everywhere - even wild ones in the fields nearby. Absolute pleasure staying here. Carol and Simon were welcoming to their home from the moment we arrived and were extremely accommodation and hospitable. An absolutely delightful stay and would definitely return next time I am in the area. We enjoyed our short break and would highly recommend the farm to others. Carol offered an extensive breakfast menu and the cooked items were beautifully presented. We had the room with a super king-sized four-poster bed that was very comfortable, and we especially appreciated the view from our window across to Ross. Plenty of good restaurants both in Ross and a short distance beyond. It's a 20 minute stroll into Ross. 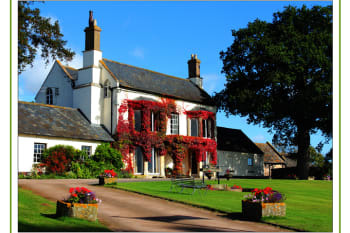 Short drives into the Forest of Dean and a variety of places well worth a visit. We were made most welcome with lovely tea and cake on arrival. Both our room and the beds were most comfortable and breakfast next morning was first class. We only had a one night stopover but hope to return to explore the area in greater depth. Very comfortable stay on this farm . Very considerate hostess, nothing too much trouble. More than adequate breakfast,yummy! Made our week in the Wye valley very relaxed. Information extremely well stocked for all the interesting places around. Italian restaurant in Ross really good, but gets very busy. The pub "Harewood" very good Choice and service as well as presentation delightful. Walking in the valley at Symonds Yat excellent. Beautiful situation. Very hospitable and friendly. Excellent choice and quality of breakfast. Vast and very comfortable four poster. Lovely stay, helpful owner and delicious food in a beautiful area. The turning into the farm is a sharp left on the dual carriageway and can easily be missed. Lots of eateries in Ross and surrounding area. We enjoyed pub meal at White Lion. very friendly helpful staff. Lovely rooms with great views. Very nice breakfast. only there one evening/night after an afternoon kayaking on the river so difficult to recommend much in the way of nearby restaurantsetc.. but a watersports day on the Wye definitely worth looking into. The house has a great folder full of info about local restaurants which we found very helpful. Carole was very welcoming and we really enjoyed our all too brief stay. Charming host, great food and accommodation. Would book again with out hesitation. White Lion in Ross. First class food and friendly staff. Loads to see and do, just look through all the welcome leaflets. Mrs. Brewer is a fountain of knowledge, with tips and info on everything any anything. The revolving display of brochures would put most Tourist Information Offices to shame! 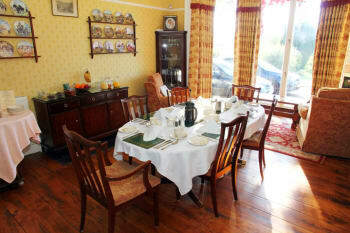 Breakfast was plentiful and full of choice, and served up in pleasant surroundings, as was the very welcoming arrival tea and cake. This also gave us an excellent opportunity to meet the other interesting guests, and swop notes with Mrs. Brewer. The Old Railway Station at Tintern, just north of the Abbey if coming down from Ross. A beautiful spot, with ample parking, very family, child & dog friendly (though we have neither child nor dog! ), lots of old carriages and railway equipment to see, beautiful walks along the Wye, and nice tea and a very interesting selection of unusual flavoured cakes to buy from the cafe in the old Station building. Also the small but very interesting collection of items housed in the (Admiral Lord Horatio) Nelson Museum in Monmouth (just off the Town centre, signposted from the outskirts), bequeathed by a local Victorian benefactor and now run by the Council; free entry, with small but varied gift shop. Made my wife and I very welcome with tea and cake on arrival. We were able to sit out in garden to enjoy that. 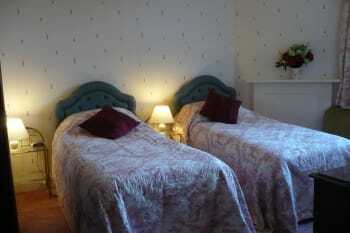 We had twin room which is spacious and beds were very comfortable and made up as a double for us. Breakfast was very good with plenty choice. Carol is very knowledgeable re local attractions and we thought the pin board map showing where these were in addition to eateries was a good idea.